Our Underdrive Power Pulley Sets increase Horsepower and Torque to the wheels without adding any stress, strain or noise to your engine, your accessories last longer as they are slightly under driven for efficiency and low drag. 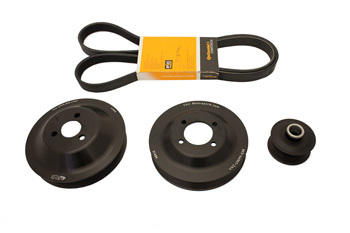 The VAC Motorsports Pulley Set includes: P/S pulley, water pump pulley, alternator pulley, and required belt(s), the OEM crank harmonic dampener is maintained for reliability in all conditions. The pulleys are quality made in house from light weight and strong 6061 T6 Billet Aluminum and are hard anodized for durability. This date can be found in the drivers side door jam. 91, 92-93 fitment not currently available. Click here to find out what makes our VAC machined products the best. From Tyler of Raleigh, Nebraska on 2/6/2015 .